Vocal sound in the live environment is arguably the most important factor of any performance but one often neglected in terms of technical facilities. In the recording studio there will be any number of signal processors and effects geared to enhancing the singer’s voice to produce the best possible recording. On the stadium touring circuit the sound companies will also employ similar tools to support the singer. At the more modest end of the industry, a singer will have a microphone, mixer, amplifier and speakers. Adequate maybe but using these alone is a far cry from the polished performance found on albums and heard in large concerts – until now! The VMS turns off the mic when not in use, evens out the volume of your voice (reducing the loud but increasing the soft parts), adds world class vocal effects and a set of intuitive tone controls. Until now you would have needed a rack full of signal processing equipment that requires expert setting up to achieve the results the VMS will give you. The mic preamp is our new low noise design featuring a 6 position gain switch simply marked LOUD & SOFT – just select the position that suits your voice. An 18dB/oct filter reduces stage rumble and mic handling noise and phantom power is available for those high quality condenser mics. The noise gate turns off the mic when you are not actually singing so your PA won’t pick up the bass player talking to the drummer! The compressor controls the volume level of your voice, producing a smoother, balanced delivery. Compression is an indispensable tool in studios but often missing in live performances due mainly to the complexity of such devices. In the VMS however, the optical compressor is tuned for the best vocal dynamic control without compromising your sound. The seven band graphic equaliser with its carefully chosen frequencies, gives all the tonal control you need to enhance and ‘sweeten’ your voice. 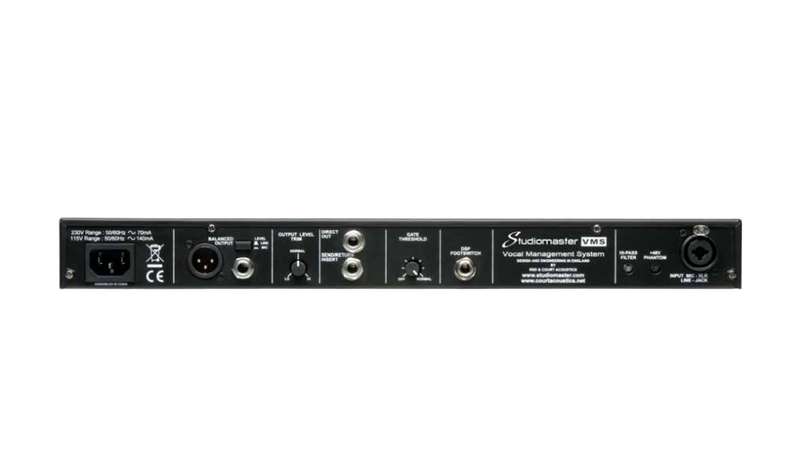 The digital signal processor (DSP) is the result of decades of effects processor experience and contains six studio quality sounds developed just for vocal. 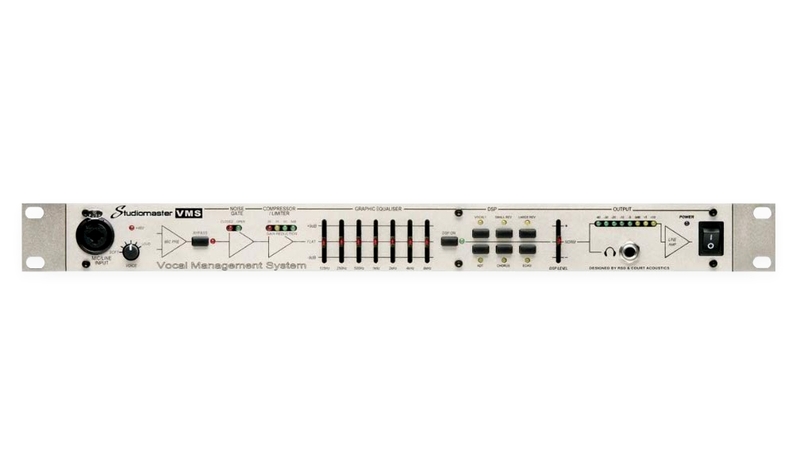 Each effect has its own button, so easy to change and the foot switch socket on the rear panel gives you the facility to turn off the effects between songs.Totally unique, the VMS is neatly packed into a 1u rack mount (or free standing) package making it very portable. The internal power supply means no wall adaptors to lose or forget. All input & output connectors are professional balanced XLR and jack and there is also a handy headphone socket on the front panel.So, although simple to use, the VMS is packed with state of the art audio signal processing electronics, to enhance your vocal talent.